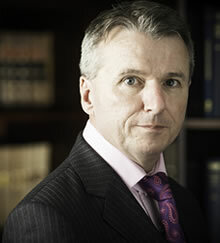 Brian McConnachie called in 1994, after 9 years as a solicitor in private practice, and quickly established himself as one of the most highly respected and well instructed juniors at the Criminal Bar. He joined Crown Office in 2002 as an Advocate Depute and in 2003 was selected to be a Senior Advocate Depute. In October 2006 he was appointed Principal Advocate Depute where he had overall practical responsibility for the prosecution of High Court crime in Scotland. During that period he was regularly involved in the consideration of FAI, Health and Safety prosecutions and all aspects of regulatory crime as well as appearing in some of the most high profile cases and appeals. In June of 2009 after over 7 years in Crown Office he returned to the defence Bar. Since that time he has been one of the most instructed Senior Counsel in Scotland. He has appeared in many high profile trials during that time. He has also contributed in the media to many of the current legal issues, particularly the abolition of corroboration. HMA v Mohammed Atif Siddique Prosecution of the first Scottish born Islamic Terrorist. HMA v Michael Ross Prosecution of a Black Watch Soldier for a murder committed in Orkney in 1994 when Ross was just 15 years old. HMA v Juan Carlos Crispin Prosecution of a Spanish National for the murder of Eleni Pachou in Di Maggios restaurant in Glasgow. George Beattie v HMA SCCRC referral of a 1974 conviction for murder involving consideration of expert psychological evidence. HMA v Rosdeep Adekoya Representing a mother charged with the murder of her 3 year old son. Ultimately pled guilty to culpable homicide. HMA v Lee Anderson Representing a man charged with the murder of a Paisley shopkeeper. Convicted of culpable homicide after trial.